Other: With Obi. 9 6:02 Burn. We are sorry for our tone is so harsh. 1 3:28 Black Night. 4 3:52 Strange Kind Of Woman. 12 5:40 Smoke On The Water. -State of Condition-. Our condition grading is based on Goldmine Record Collectors guidebook. CD Condition : Very Good (Light scratches - plays perfectly) ( 'MADE IN W. GERMANY BY POLYGRAM' / Matrix: 831 318-2 01 #). 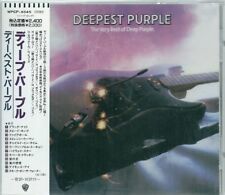 DEEP PURPLE In Rock JAPAN 1st Press CD 1987 32XD-898 3200Yen RARE! JAPAN CD, 32XD-898, 1st Press 1987, Out Of Print. DEEP PURPLE / In Rock. Into the Fire. Made in Japan. It's so hard to find even in Japan! Cover:Excellent No fading. USA,Canada. Hard Lovin' Man. DEEPEST PURPLE. GREATEST HITS CD. DEEP PURPLE. JAPAN REPLICA. LIMITED EDITION. Black Night. Woman from Tokyo. Strange Kind of Woman. DEEP PURPLE - GREEK Promo CD Set. 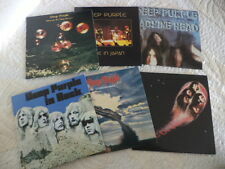 Α must collector's set for any Deep Purple fan! DEEP PURPLE Infinite Double CD The Gold Edition. P.O. Boxes are preferred. Format: 2 X CD Reissue, The Gold Edition. 2-10 Space Truckin’ 5:02. 2-5 Uncommon Man 6:41. 1-8 On Top Of The World 4:01. 2-13 Black Night 7:26. DEEP PURPLE / live in japan. condition GOOD format CD. 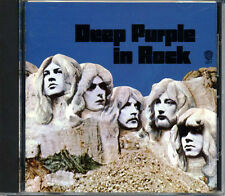 Deep Purple CD Icon. Call Of The Wild. Knocking At Your Back Door. ♫♫♫♪♫♫♫♪♫♫♫♩♫♫♫♩. Hungry Daze. Dead Or Alive. Hard Lovin` Woman. The Unwritten Law. 9 Trouble Man. IMPORTANT: you may choose free item only from CD catalogue, not from DVD, Blu-Ray or Mini LP. You will get free souvenir gift as well. We are promise to you – we will resolve your problem! JAPAN 24k GOLD CD, 1999 issue. This is a Rare Japanese 24k GOLD CD released from WB/Warner-Pioneer Corporation Japan in 1999. Excellent:Few Slight Scratched,Scuffs,Slight Bit Folded(Stain) with the insert(OBI). DEEP PURPLE. CD MADE IN BRAZIL 1995. LABEL : MUSIC TAPE # MT CD 1104023. SILVER FACTORY PRESSED CD. ASK EVERYTHING YOU NEED TO KNOW AND I WILL ANSWER AS SOON AS POSSIBLE! 2006 compilation from the veteran British rockers. Though the band has undergone many line-up changes throughout their 40 year history, they've remained one of the most popular and relevant Classic Rock bands in Rock history. JAPAN 24k GOLD CD, 1999 issue. This is a Rare Japanese 24k GOLD CD released from WB/Warner-Pioneer Corporation Japan in 1999. Very Good:Polish Marks,Many Scratches,Large Split with the insert(OBI). Excellent:Few Slight Scratched,Scuffs,Slight Bit Folded(Stain) with the insert(OBI). CD Case - Very Good. U.S. WORLDWIDE. W/'Forever Young' OBI 7-page PICTURE SLEEVE fold-out INSERT. JAPAN CD, 1989 'Forever Young Series' reissue. OBI: Ex--(Light discoloration on spine. Light stains.). SEE THE PICS. Excellent:Few Slight Scratched,Scuffs,Slight Bit Folded(Stain) with the insert(OBI). Machine head (1972). Deep Purple. The Largest Collection in Germany. Second Hand and New. Here you may buy music at very low prices. 1 Hush 4:23. 16 Burn 4:31. 10 Smoke On The Water 3:46. 15 Might Just Take Your Life 3:33. 11 Highway Star 6:06. 5 Black Night 3:21. 3 The Bird Has Flown 2:51. 8 Strange Kind Of Woman 3:46. CD Case - Good. Liner Notes - Very Good. U.S. WORLDWIDE. 9 Birds Of Prey 5:48. 8 On Top Of The World 4:02. DEEP PURPLE Burn JAPAN 1987 1st Press CD 32XD-899 3200Yen RARE!! DEEP PURPLE / Burn. JAPAN CD, 32XD-899, 1st Press 1987, Out Of Print. Lay Down, Stay Down. Made in Japan. It's so hard to find even in Japan! Released. 1987 out of print! Cover:Excellent No fading. DEEP PURPLE Burn JAPAN Limited 24k GOLD CD 1999 MEGA RARE!! DEEP PURPLE /Burn. Japan, 30th Aniversary Limited Gold CD. Made in Japan. It's so hard to find even in Japan! Released. 1999 out of print! USA,Canada. What's Goin' on Here. If you get the item and unsatisfied with it. EXCELLENT: EX CD/INSERT/OBI in great condition,no obvious used marks/scratches/scuffs. DVD From Here To Infinite. CD-15 Hip Boots (Rehearsal, Ian Paice's Recording). CD-11 Paradise Bar. Obi - Good. U.S. WORLDWIDE. Disc - Like New (No Scrathches). U.S. WORLDWIDE. Deep Purple: Made in Japan *USED* (CD, 2001, Maximum) Russian Pressing! (CD, 2001, Maximum) Russian Pressing! 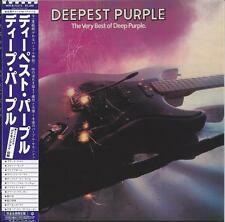 Deep Purple: Made in Japan USED . Very rare and long out of print original Glenn Hughes CD release "From Now On". The CD was released on Empire Records in 1994. This is the original import CD release and is not a remaster or reissue. Hier folgende CD / Here following CD A Touch Away. Classic Rock & Pop. Rock englischsprachig. A Castle Full Of Rascals. 1 3:24 Fireball. 3 5:18 Demon's Eye. Other: With Obi. We are sorry for our tone is so harsh. Our condition grading is based on Goldmine Record Collectors guidebook. If you'd like to know accurate condition of individual item. Advance Promo. Deep Purple. ‘The Early Years’. Blind [2003 Remix]. Bird Has Flown. Wring That Neck [BBC Session]. This item is NEW/SEALED and is the official Gold Typhoon Music Taiwan release. Other: With Obi. 8 6:07 Black Night (Live in Verona, Italy on 06-09-1987 and Oslo, Norway on 22-08-1987). We are sorry for our tone is so harsh. Our condition grading is based on Goldmine Record Collectors guidebook.